LOMO T-43 coated lens. Film can be rewound by hand in a darkroom. Spring leaf shutter: 1/15-1/250 and B. Focusing: 1m-∞. Aperture: f/4-f/16. Warranties: There are no Warranties on any Product unless Stated. Great condition, tested and worked great. SMENA SYMBOL Russian LOMO Camera MADE IN USSR. Shipped with USPS Priority Mail. Camera Smena-8M Lomo with T-43 lens f/4 40 mm, made at Lomo plant. NOS! First of all, we appreciate your interest in buying from us. They were made 25-50 years ago, but all of them are in working condition, fully CLA (Cleaned, Lubricated and Adjusted). These defects do not affect the quality of the lens or image and a lot of Soviet lenses have excellent quality and are really affordable. USSR (# 053828). Case is bakelite, the back wall is removable. Used film type 135 standard cassettes. Shutter is separate from the film. On this version there is a separate button rewind. Shutter central, values of exposures 1/200 — 1/10, and "B". Since 1961 GOMZ used thermoplastic instead of bakelite. Lens: T-22 (Triplet) 40mm f/4,5. There is wearing on the body and along the lens and body edges. The dial on the top is cracked. 100% OLD USSR RUSSIAN ORIGINAL! 6 pieces of film - shelf life overdue in 2008. Photon flash "Фотон" - new (not used) with instruction in Russian. Made in Leningrad, USSR. LOMO optical factory. Diaphragm scale: 4; 5.6; 8; 11; 16. The lens is clean and clear, no scratches, has no fungus. Do you know how to take photo?Set ASA 400 make shotting and make developing in C-41. It has a removable back and uses a film cassette to film cassette film transport. The viewfinder has a button which must be pressed to wind the film and a film counter. All pictures are actual, you receive what you see. No more strap lugs. On early models body still can see the signs of strap lugs. Do you know how to take photo?Set ASA 400 ,make shotting and make developing in C-41. The shutter has speeds of 200,100,50,25,10 and B. It has a removable back and uses a film cassette to film cassette film transport. I do not check for and do not know if there is any issues that are not visible on outer case. Serial Body: # 148641. Shutter speed: B - 1/15 -1/250 of a second. 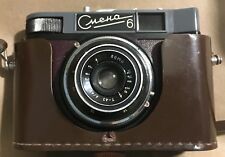 Vintage Soviet camera Smena 8. LOMO. 2 LOMO SMENA 35CM .MINT Condition. Both in working condition, exellent for 35mm lomography. T-43 40mm f4 lens. ALL PICTURES ARE ACTUAL, YOU RECEIVE WHAT YOU SEE. The taking lens is clean and free from scratches. The viewfinder shows nice image. Aperture blades are clean and move properly. Shutter needs wind up twice to firing, but all speeds run properly. Film counter seems to work. Made in Leningrad, USSR. LOMO optical factory. The lens is clean and clear, no straches, has no fungus. Diaphragm scale: 4; 5.6; 8; 11; 16. "GREAT OCTOBER-50" ANNIVERSARY version. Tripod thread – 1/4". Made by LOMO (ЛОМО) factory. Other all functions seems as good as they could be. Not film tested. Very rare type. Do not miss this great opportunity to own a piece of photographic history! Black body. This one was produced by famous LOMO plant in Leningrad, USSR, in 1973. Shutter speeds: from B to 1/250. All-glass coated Lens: LOMO T-43, 4/40. Youliked the product, but didnot like the price. You buy exactly what you see in the photo ! 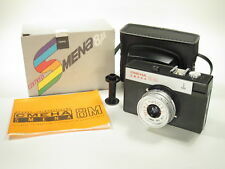 Vintage Soviet camera "Smena 8m"
"Shims-8" and "Shifts-8M" were released in total in the amount of 21,041,191 copies. (for 1995 inclusive). After you receive the goods. After you receive the goods. I do not check for and do not know if there is any issues that are not visible on outer case. Manufacturer LOMO. The flash can be synchronized with the central shutter at any shutter speed up to 1/250 s, which is not inferior to modern high-end mirrors. ☑ Very profitable proposition! All pictures are actual. Lot includes leather original case. The taking lens is clean and free from scratches. The viewfinder shows nice image. Aperture blades are clean and move properly. Shutter works at all speeds. Film counter seems to work. The case is in good condition for age. Even winding of film is separated from shutter cocking. § Film type: 35 mm film. All pictures are actual. § Focal range: 1 m to infinity, scale-focus. You will be satisfied. The flash can be synchronized with the central shutter at any shutter speed up to 1/250 s, which is not inferior to modern high-end mirrors. Lens: Triplet-43 4/40. ☑ Very profitable proposition! Manufacturer LOMO. Cocking lever: also winds the film, on the back of the front plate. All pictures are actual. Focusing: manual, guess the distance or use symbols on the scale. serial no. on the bottom plate, the first two digits show the production year.